McCormick Rotisserie Chicken Seasoning provides uncompromisingly delicious, traditional, slow-roasted, rotisserie flavor with or without a rotisserie oven. It is blended for flavor without added MSG. 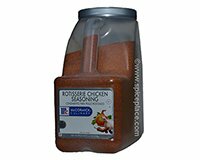 Rotisserie Chicken Seasoning is used with chicken for a juicy, tender, crispy-on-the-outside rotisserie-style chicken. It is appropriate to use as either a rub or a marinade. Ingredients: Salt, Onion, Spices, Paprika, Garlic, Citric Acid and Silicon Dioxide (to Make Free Flowing). Rotisserie Chicken Recipe: Evenly coat 12 pounds of bone-in chicken pieces with 1/4 cup McCormick Rotisserie Chicken Seasoning. Cover and refrigerate overnight. Evenly coat chicken again with 1/4 cup McCormick Rotisserie Chicken Seasoning and roast slowly, basting often. To cook: in a conventional oven, roast at 325° F for 1 to 1-1/2 hours; in a convection oven, roast at 300° F for 1 hour. Marinated Rotisserie Chicken Recipe: Combine 1/2 cup McCormick Rotisserie Chicken Seasoning with 3/4 cup water to make a wet marinade for 12 pounds bone-in chicken pieces. Brush onto both sides of chicken, cover and marinate overnight. Before roasting, sprinkle 1/4 cup McCormick Rotisserie Chicken Seasoning over chicken. Roast on racks; baste once during cooking. Roast in a conventional oven, at 325°F for 1 to 1-1/2 hours; Roast in a convection oven at 300° F for 1 hour. Buttered Rotisserie Chicken Recipe: Wash and pat dry 3 whole chickens, 5 pounds each. Blend together 1/2 cup melted butter, 2 tablespoons canola oil and 1/4 cup McCormick Rotisserie Chicken Seasoning. Brush butter mixture over chickens, coating completely. Place in oven and roast until internal temperature is 160°F.